If you are a Marketing Director or Assistant, we know how difficult it can be to convince your CEO that you need more money in your budget, let alone finance a redesign of your website. After all, they’ll probably just tell you to go “sprinkle some SEO” on it. But you know it will take much more than that to fix your website woes and digital marketing metrics. You need a few specific tools and a process to evaluate your website before you're ready to present those findings in a compelling way to your boss. It probably sounds like a lot of work, but it’s totally doable. There are many tools that will help you audit your website with a set of established criteria, such as HubSpot's Marketing Grader (which gives you instant top-level results) or our more detailed Website Self-Audit Kit. If you choose to complete our self-audit kit, at the end you'll have a list of things you do well and things you need to work on, with a letter grade giving you an overall score. Let's get started! Let's dive into each of these criteria. 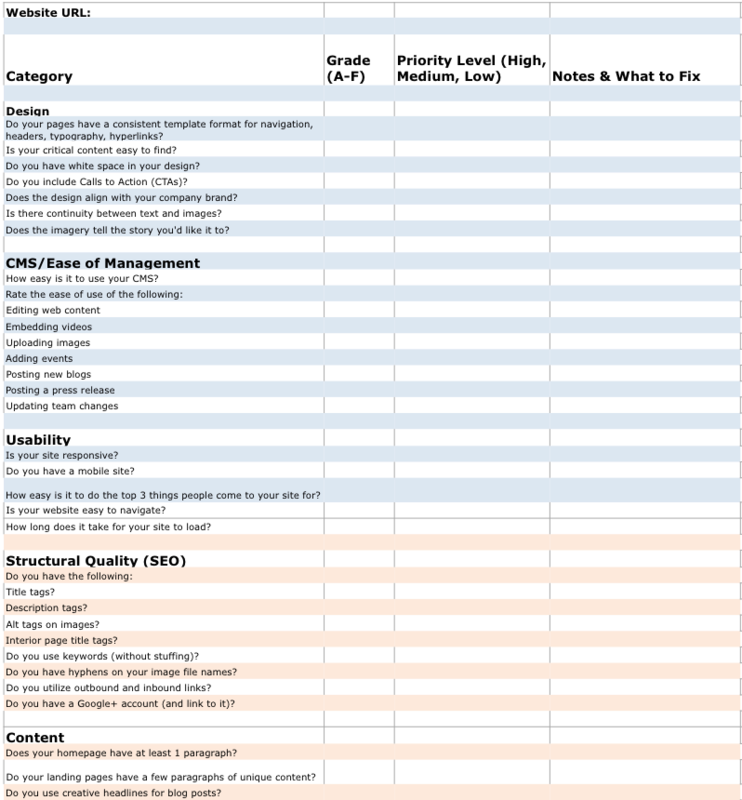 Ask these questions as you evaluate your website. Do you have marketing strategies and goals? Do you know how many website leads you need to generate to set up the sales team for success? Are you currently generating leads from your website? Is your website exhibiting an overall positive growth pattern? Do web visitors do what you want them to do (i.e. If you have an e-commerce website, are people buying your products)? Do you analyze your metrics and look at progress reports? Do you know what the purpose of each page is? Do you have calls-to-action (CTAs) on each page? Do you have landing pages with downloadable offers? Do you utilize strategic email marketing? Do you have lists of prospects from your offers? Are your current marketing tactics generating traffic? Do you know what people are engaging with the most? Do your pages have a consistent format for navigation, headers, text, typography, and hyperlinks? Is your critical content easy to find? Does your design help make the content more digestible? Do you include CTAs that give visitors a clear path to guide them along the way? Does the design align with your company brand? Is there continuity between text and images on your pages? Does the imagery tell the story you’d like it to tell visually? How easy is it to use your Content Management System (CMS)? How easy is it to do the top 3 things people come to your website for? How long does it take for your site to load? Do you use keywords (without stuffing)? Do you have hyphens on your image file names? Do you utilize outbound and inbound links? Does the homepage clearly describe what you do and/or provide? Do your landing pages have a few paragraphs of engaging, unique text? Do you use creative headlines for blog posts? Are you providing fresh content on a consistent basis that your users will want to read? Is the text on your pages written for search engines or humans? Are your blogs salesy or educational? Did you pull copy from a print brochure or promotional material to put on your site? Do you have duplicate content on several pages? Are there spelling or grammar mistakes on your pages? Do you use bulleted or numbered lists to communicate key lists? Does your site have an SSL (secure-socket layer) Certificate? Is your CMS running on the latest version? What is your technical support / maintenance set up? If you have access to your data, you should be able to get a thorough look at how your website is performing, it's strengths and weaknesses. If you don't have access to your data, do it anyway because you can still make educated guesses on how well your website is performing. Also, install Google Analytics now. It's better late than never. Give yourself a grade on each of these questions, A to F, using the next steps for how to record and present your findings. A spreadsheet is useful for auditing your website in depth. You can take notes about priority pages and sections, assign a grade for each page and section and take notes (like, if you find broken links and spelling errors). For a marketing focused website that is designed to primarily generate leads (including a blog) with responsive design, it will cost you $25,000-$35,000. If you want e-commerce capabilities, those websites start at $40,000. For lots of content, features, employee profile pages, new content written for you, and e-commerce, a new site will cost over $60,000. For $60,000-$100,000+ you will get custom, aggressive digital marketing implementation (SEO, social media, lead generation). Keep in mind that more content, individual pages, and specialized functionality will push your budget into a higher range. Many agencies are moving toward long-term website engagements for clients who want to stay current, adapt to the market and take a data-driven approach to their website. Some of the advantages of this approach include: a set monthly budget instead of one large payment, ongoing support, quicker launch time and agile methodology. Your budget is based on how aggressively you want to work toward your marketing goals. Step 4: Prepare a Convincing Presentation and Make Your Case. Create a professional grade slide deck with the results of your audit, and lucky for you, we included a PPT template in the kit to make it simple. Now it's time to make your case to the Boss or Board. It's important to present with confidence and believe in your findings. Use statistics and data that make the case for good design, proven processes, and potential ROI. If you take a methodical approach to evaluating your website, you'll be armed with hard data and prepared to make convincing arguments in favor of a new website. If you need backup in your quest, let us know because we'd love to help.